As we are having the third weekend in a row with snow predicted, I am really longing for spring. 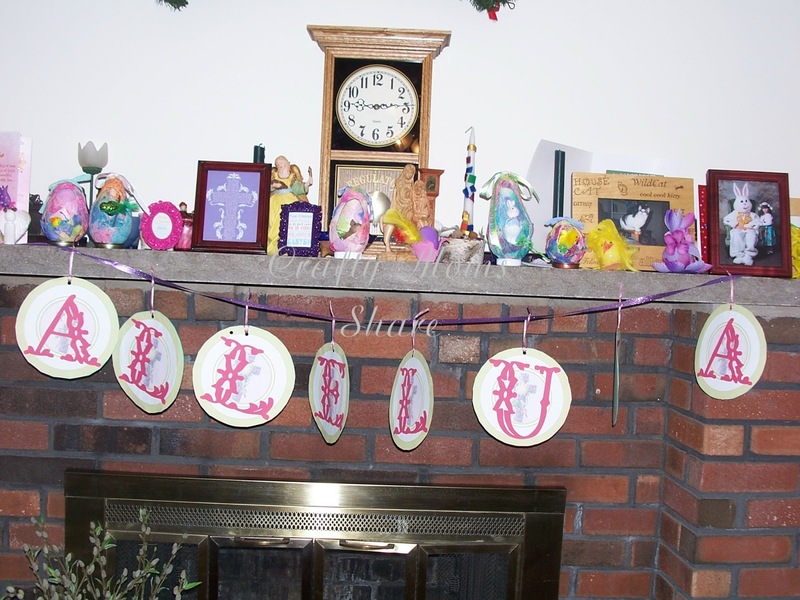 I pulled out our Easter decorations. I know we will make some new ones this year as well, but at least for now it feels like spring in our house. I also made two garlands which I will share with you at the bottom. This past week was school vacation week, so Hazel and I headed to Cape Cod to visit my parents. 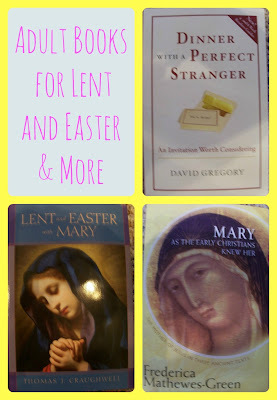 There I went to one of my favorite stores, The Priory, and bought some new books for Easter and Lent. I will share them here as well. Here is a quick picture of our mantle. 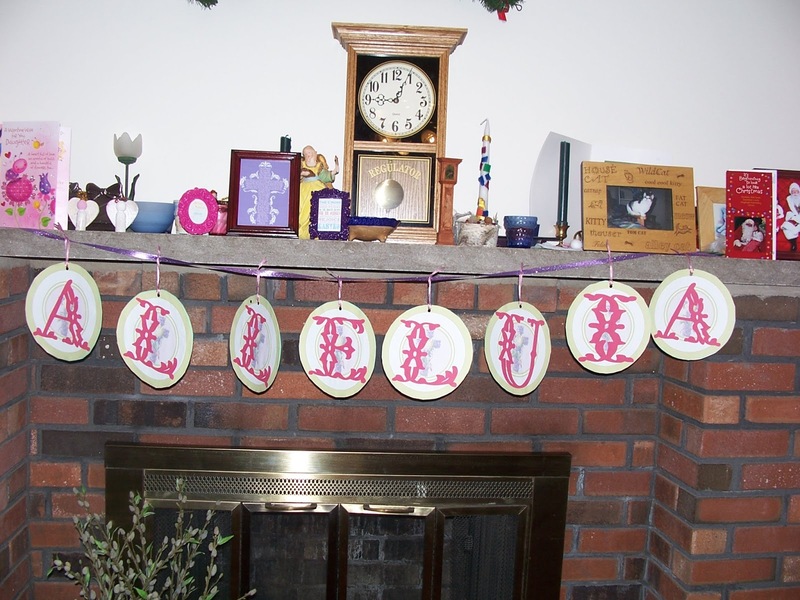 I made an Alleluia garland. I got the idea at Catholic Icing, however I wanted to make my letters more Easter related. I found the beautiful flowered cross in My Memories and made the garland. I will share it at the end. Then I also found three beautiful printables for Easter this year. I used frames I had and/or bought on clearance at Michaels post-Christmas sale. The printable in the pink frame came from Day Spring. The scripture in the cross shape came from Agape Love Designs and she has other colors as well. The subway art came from A Night Owl and she offers it in different color schemes as well. Some of the other things on the mantle are from last year. We have our Lent tree which we got at church last year and the picture of Hazel with the Easter Bunny last year. 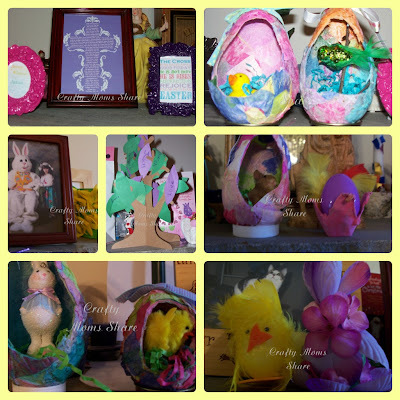 Then there are our tissue paper eggs dioramas. Hazel wants to make some more of those. 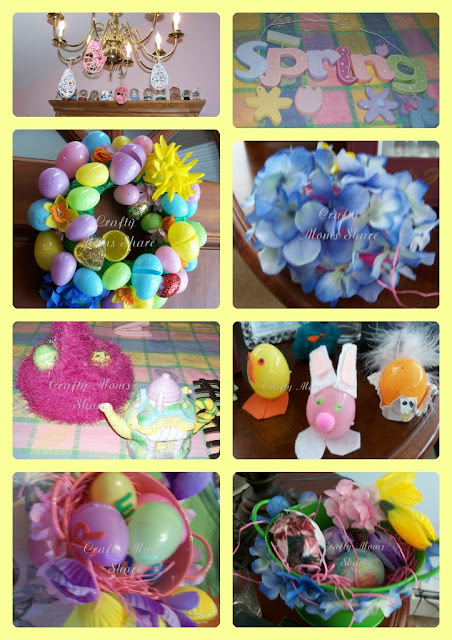 Then we decorated many plastic eggs and baskets with flowers or as chicks and bunnies. We also made egg carton chicks. I hung our string eggs on our chandelier. I am thinking we should add some crosses to the other arms. I felt funny about welcoming spring this early, so I did not hang our spring sign out yet, but I did hang up our Easter egg wreath. We have many more of our flower decorated eggs and baskets and buckets as well as our bunnies and chicks around. We also have a beautiful basket my mother knitted for me filled with fabric covered Easter eggs. We attempted our own (see the green basket on the bottom) and gave a tutorial here. The pink bucket/basket holds Hazel's Resurrection Eggs. She will be making another set of these in Sunday School this year. Here are some of the books we shared last year for Easter. This year I bought Hazel a couple of books for Easter and one that has a nice religious message. 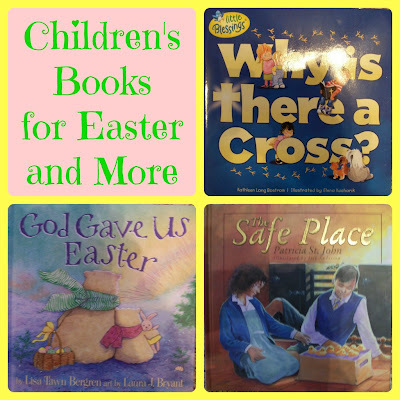 God Gave Us Easter by Lisa Tawn Bergern will be in her Easter basket. Then some books I am currently reading or will be reading for preparation of Easter and my own interest. My church is doing a Lenten Book Group reading Dinner with a Perfect Stranger by David Gregory. I am continuing my interest is Mary and found Lent and Easter with Mary and Mary as the Early Christians Knew Her. I cannot wait to get to reading these. The Lent one is a daily short reading. I just need to catch up since I just got it. Many more Easter ideas to come, but this is how we are getting into the spirit. Oh, and I have given up chocolate for Lent. We will see if I can make it through my chocolate cravings, but so far I'm doing well. Now for the free printables!! For the smaller garland you need two pages. For the larger garland you need eight pages. 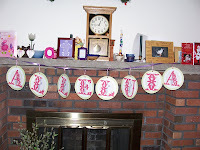 So many cute ideas :) I really love the garland, it is so sweet.